An impressive last to first debut winner at the start of the month, March X Press (2f Shanghai Bobby x Indian Rush, by Indian Charlie) confirmed her potential with a fast finishing win in the $100,000 Bolton Landing Stakes at Saratoga. 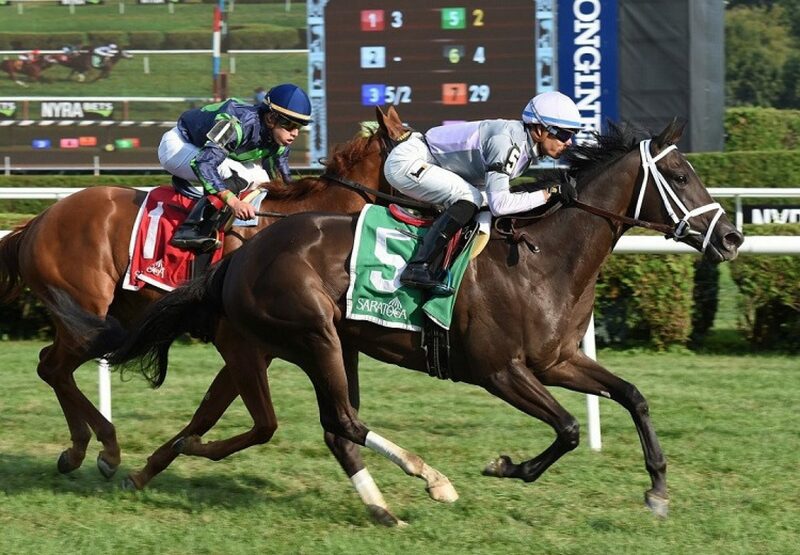 The Todd Pletcher trained filly was slow to begin and settled back in the field, but after working her way into the clear was able to find the line strongly to post a half-length win in the five and a half furlong turf sprint. "There was a moment there where things got a little crowded and she showed a lot of bravery on her second start to push her way through there,” said Todd Pletcher. “She has an explosive turn of foot in that last part. She had to push her way through a little bit, and for a lightly raced filly to do that, it is impressive. I think maybe something like the [GI] Natalma [Sept. 17 at Woodbine] going a one-turn mile is something that might make sense for her." A $90,000 Keeneland September Yearling purchase, March X Press runs for Golconda Stables and is a three-quarter sister to stakes-winner Harlan’s Honor, who is by Shanghai Bobby’s sire Harlan’s Holiday from stakes-placed Indian Rush. March X Press is the first stakes-winner for Champion 2YO Shanghai Bobby, who is also the sire of stakes-placed Bobby Ax and Spirit of Shanghai.